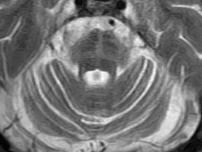 Axial T2 images at the level of Pons show a cruciform hyperintensity so called "hot cross bun" sign. An associated atrophy confined to brain stem and cerebellum. 1st Autonomic failure/urinary dysfunction, 2nd Parkinsonism 3rd Cerebellar ataxia and 4th corticospinal dysfunction. Definitive diagnosis of MSA requires pathological confirmation. The so-called "hot cross bun sign" is specific for MSA but not pathognomonic for MSA.